Mars’s methane has gone missing. Scientists first detected traces of the gas—a critical indicator of life on Earth—in the planet’s atmosphere decades ago. But today, researchers reported that a European satellite hasn’t spotted a single trace of methane. The finding, if it holds up, could complicate scientific dreams that martian microbes might be spewing the gas in the planet’s subsurface. 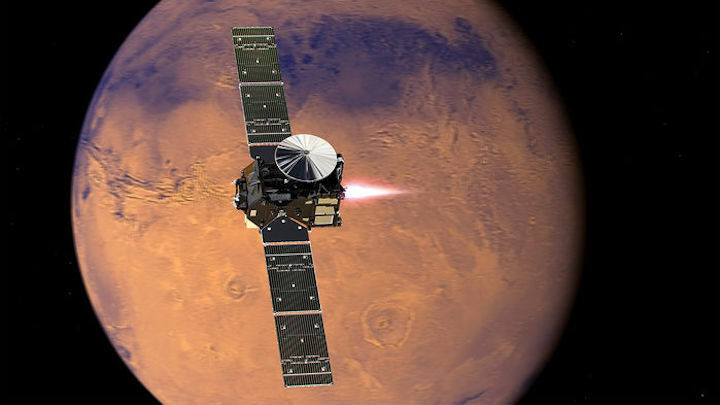 The Mars Express orbiter first detected hints of methane in the martian atmosphere in 2004. But some scientists said the orbiter’s instruments that found it—at a level of 10 parts per billion (ppb)—weren’t sensitive enough to produce reliable results. Ten years later, NASA’s Curiosity rover detected a methane spike of 7 ppb from its base in Gale crater, which lasted several months. Several years later, Curiosity’s scientists then discovered a minute seasonal cycle, with methane levels peaking at 0.7 ppb in the late northern summer. The team’s initial results show no detection of methane down to a minute level of 50 parts per trillion, with their observations going down nearly all the way to the martian surface. For now, the methane mystery has only deepened. The TGO will keep running until 2022, enough to capture at least a couple martian years. Its data will grow more precise and its detection limits will drop. And perhaps then scientists will know whether their hopes for methane-spewing microbes, already on life support, have reached an end.